• For quantitative determination of invertase/sucrase activity. • Sensitive and accurate. As low as 0.007 U/L invertase activity can be quantified. • Invertase (b-fructofuranosidase, EC 3.2.1.26) is an enzyme that catalyzes the hydrolysis of sucrose to fructose and glucose. Invertases cleave at the O-C(fructose) bond, whereas a related enzyme sucrase (EC 3.2.1.48) cleaves at the O-C(glucose) bond. A wide range of microorganisms produce invertase and can, thus, utilize sucrose as a nutrient. Invertase assay finds wide applications in environmental (e.g. soil), agricultural and food (confectionery) industry. BioAssay Systems Invertase Assay Kit provides a convenient and ultra-sensitive colorimetric and fluorimetric means to measure invertase activity. In the assay, invertase cleaves sucrose, resulting in the formation of fructose and glucose, which is determined by a colorimetric (570nm) or fluorimetric method (λex/em = 530/585nm). The assay is simple, sensitive, stable and high-throughput adaptable. 1. Can the EnzyChrom™ Invertase Assay be used to determine sucrase activity? Yes, sucrase is the same as invertase. 2. How do I prepare honey samples? Due to the high sugar content in honey, a 10 kDa cut-off centrifugal filter is needed in this experiment to remove background sugars (e.g. VWR Cat No: 82031-348). 1.) Accurately weigh out 10 mg of honey and dissolve it in 500 µL of H2O (50 fold dilution). 2.) Add 500 µL of the dissolved honey into the centrifugal filter. Centrifuge at 12,000 × g at 4°C until most of the liquid (there should be less than 50 µL left) has passed through the membrane (~20 min). Dispose of the eluent. 3.) To wash the invertase, add 500 µL of H2O to the tube and centrifuge at 12,000 × g at 4°C. Dispose eluent. Repeat wash one more time. Allow most of the liquid (less than 50 µL should remain) to pass through the filter. 4.) Dilute the concentrated invertase in the filter membrane by adding 500 µL of 1X reaction buffer. The sample is ready to be assayed. Refer to the EIVT product datasheet for instructions. 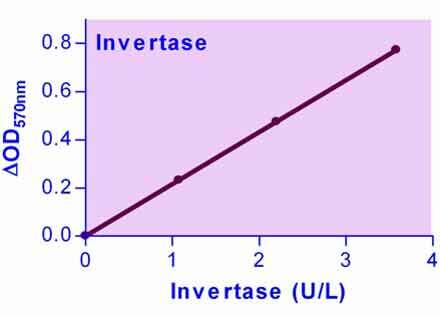 Note: Levels of invertase may vary in honey samples, therefore if the signal is to high, serially dilute the invertase sample to determine the appropriate dilution to work with and multiply the calculated activity by the dilution factor. If the signal is too low, adjust the dilution in step 4. Adjusted Calculation: Invertase Activity: ((Rsample - Rcontrol)/(slope × t)) × (5×10-4 L/10 mg) (U/mg) Where 5 ×10-4 L comes from the 500 µL of reaction buffer added to dilute the concentrated invertase in the membrane and 10 mg was the initial mass of honey. 1. Chua, L. S., et al. (2014) "Effect of thermal treatment on the biochemical composition of tropical honey samples." International Food Research Journal 21(2): 773-778. Assay: Invertase/Sucrase in Honey (Pubmed). 2. Ciesielska, K et al (2014). Exoproteome analysis of Starmerella bombicola results in the discovery of an esterase required for lactonization of sophorolipids. Journal of Proteomics(98):159-174 Assay: Invertase/Sucrase in S. bombicola protein extract (Pubmed).